V-Strom 650 ABS - SUZUKI MOTOR - Magyar Suzuki Zrt. The ultimate tackle to Do-It-All. The tool that never lets you down. Think of a task, a challenge, an adventure. The answer to every thought. V-Strom 650. 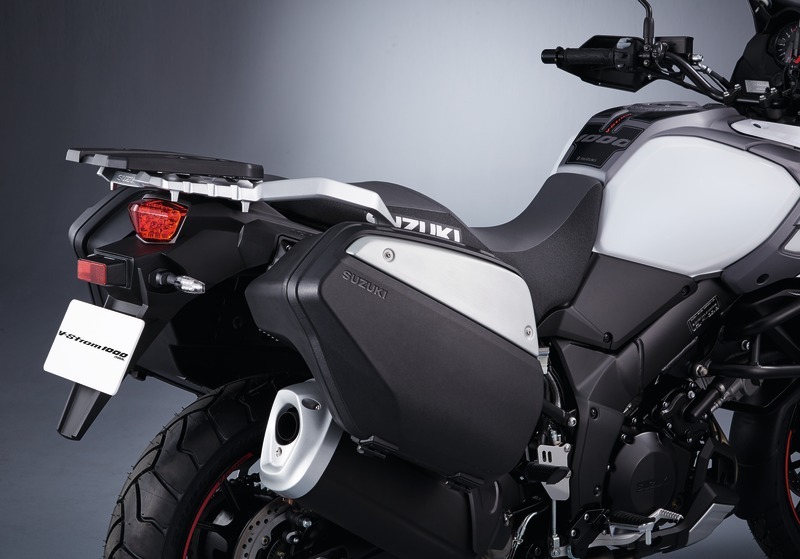 The new V-Strom 650 is avaliable in two versions, the standard V-Strom 650 and the more equipped V-Strom 650XT. The 645cm3 DOHC V-twin is a masterpiece of Suzuki engineering which has an evolving history. For the new 650, this unit has been tuned for ample low to mid-range torque for practical use while maintaining an exhilarating top-end. The new unit now meeting Euro4 emission standards has undergone a rebuild, installing new technology such as the resin-coated pistons, and revising over 60 components of the engine to achieve a higher output in a broad area of the rev-range while keeping the unique V-twin character with low fuel consumption. 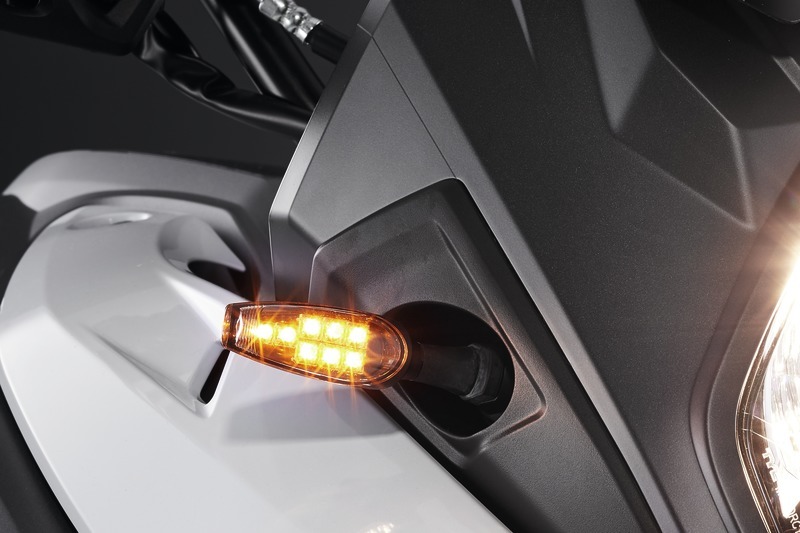 With low fuel consumption combined with the large 20L fuel tank, the riding rage between fill-ups are at the top in this class, relieving the rider from the stress of frequent refueling. 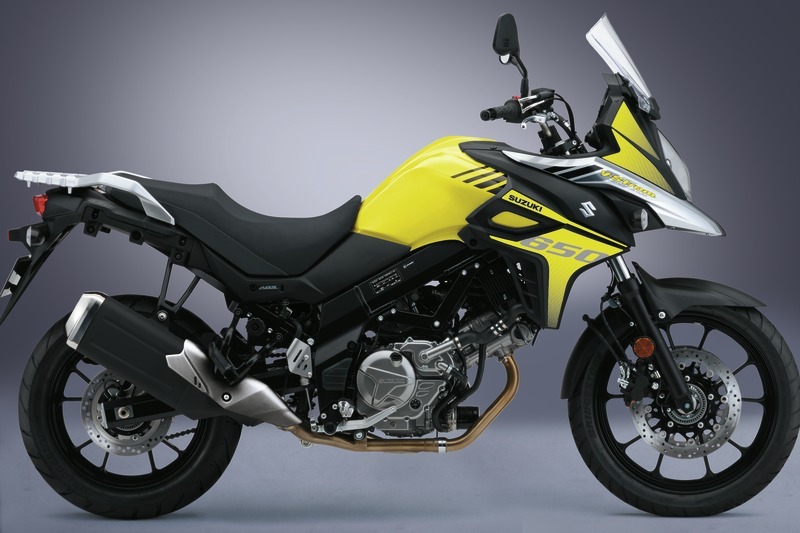 The further evolved new engine has succeeded in emphasizing the attractions of the V-Strom 650 character, making it another masterpiece by Suzuki. 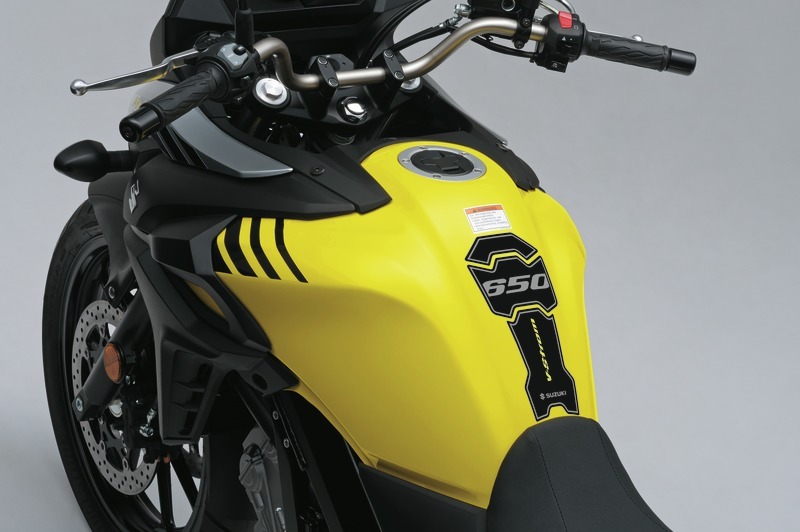 Newly designed down-type exhaust system is lighter and closer to the center of gravity, contributing to nimble handling while being able to accommodate the slim and smart optional luggage system. The catalyzers have been positioned in a tandem configuration achieving the required level of emission control for Euro4 emission standards, while successfully gaining exhaust efficiency to boost the output. Inheriting the favored traction control system from the V-Strom 1000, the new V-Strom 650 ABS/XT ABS now also is equipped with this advanced technology. This system continuously monitors the front and rear wheel speeds, throttle position, crank position, and gear position with various sensors, and controls the engine output by managing the ignition timing and air delivery. The traction control system can be switched to either of two modes, or off. The modes differ in terms of sensitivity. Mode one allows modest rear wheel spin for more advanced, exhilarating riding, while mode two activates traction control at the slightest loss of rear-wheel grip to give you greater confidence on slippery surfaces or in the rain. The choice of modes can be quickly and easily made by selecting the traction control mode from the left switch cluster and confirming it with a glance at the instruments. 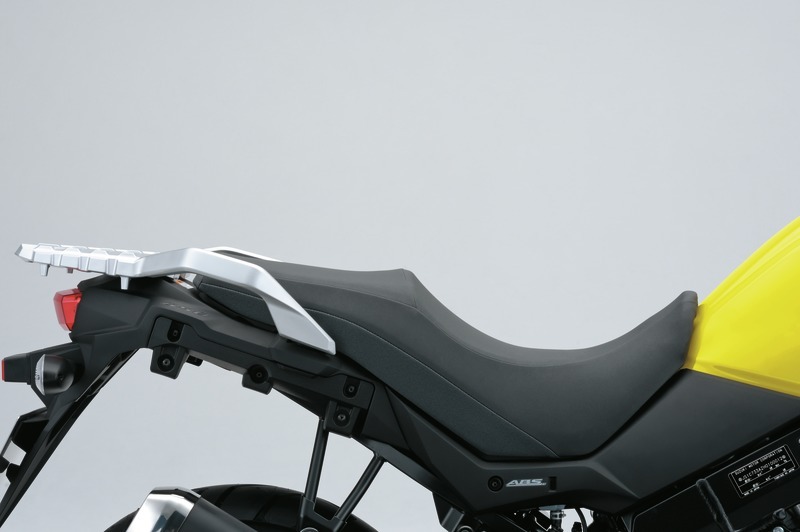 In difficult riding situations such as cold or ragged road surfaces, fully loaded with luggage, or with a pillion rider, this advanced system already established on the V-Strom 1000 shall back up the ride. By sharing the easy to see and easy to operate/understand instrument cluster, along with the cowling image with its bigger brother, the new 650 now has rich information with a quality design. The new instrument cluster incorporates a large analogue tachometer and digital readouts for the gear position and speedometer. The digital section below displays the odometer, twin-trip meter, clock, fuel level, coolant temperature, ambient temperature, battery voltage, range on remaining fuel, average and instantaneous fuel consumptions, and traction-control modes. The remaining fuel range continues to display after the fuel gauge shows empty, offering the rider with accurate and comforting information. Plus, instantly recognizable LEDs provide freeze*, high-beam, neutral, malfunction indicator lamp (MIL), ABS, traction-control mode, and water-temperature indicators. All of this information is accessible from the left handlebar switch, where it is now also possible to reset the trip meter. 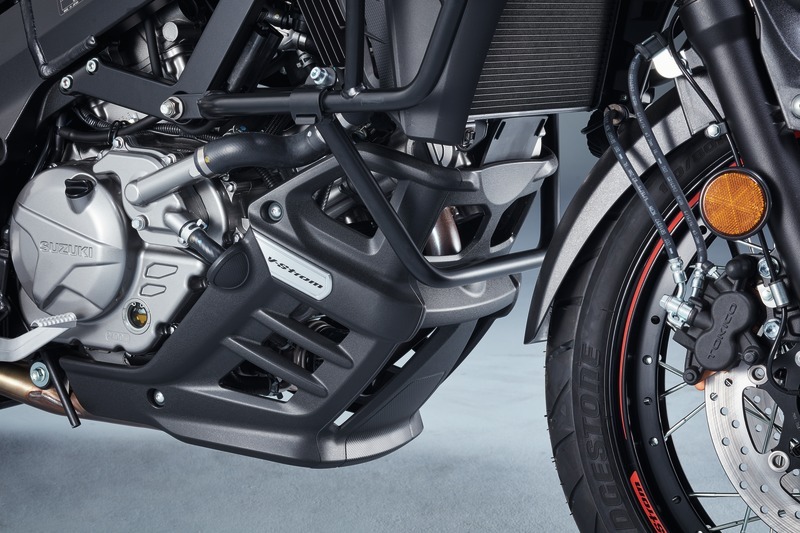 Equipped with 310mm diameter twin discs with twin two piston calipers on the front and a 260mm diameter single disk with a single piston caliper on the rear, the V-Strom 650 ABS and 650XT ABS provides controllable and dependable stopping performance. Also the compact and light-weight ABS, to avoid wheel lock caused by excess hard braking, has been upgraded to the next generation with advanced settings for a further natural feel and secure activation. By adopting the new Low RPM assist system, the concern of an unexpected engine stall has been relieved. This system will automatically raise the idle speed when engaging the clutch or when riding at low rpms, assisting frequent clutch work in congested town rides and preventing sudden and unexpected engine stall when running in the low rpm range. 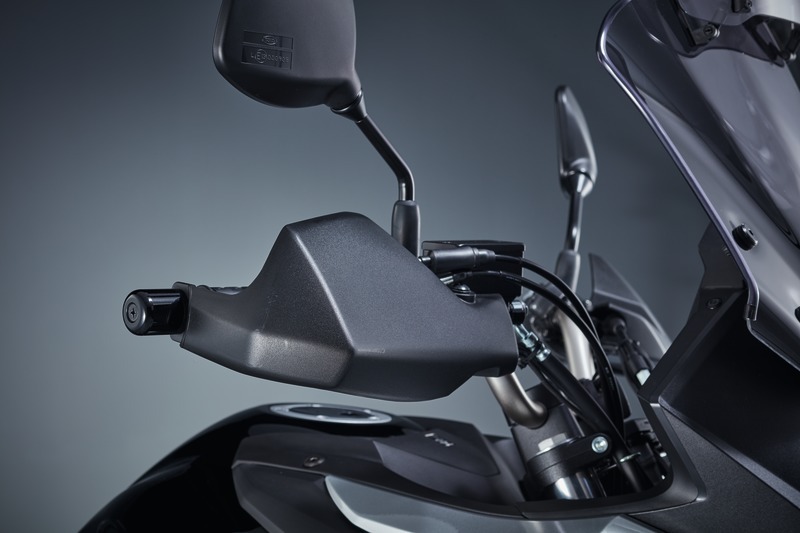 Conventional starter switches needed to be pressed by the rider until the engine starts, but the new model has adopted the Suzuki Easy Start System enabling the engine to start with one push of the button. A computerized ECM checks the status and disengages the starter motor immediately after start, making the engine start easier for the rider. Featuring the performance-proven Suzuki Dual Throttle Valve (STDV) injection system, each cylinder has two butterfly valves for enhanced power output and efficiency. One butterfly valve is directly linked to the riders throttle control while the other butterfly valve is controlled by the ECM and operates according to information from the throttle position sensor, engine speed sensor and gear position sensor for optimum intake flow, realizing an efficient and smooth power delivery with ample torque at low revs. Idle speed control is also a feature, supporting a steady idle speed and fewer emission. The injectors have been upgraded to a 10-hole type with a long nozzle for further efficiency. The redesigned slimmer and smarter tank still holds a capacity of 20L, realizing a long riding range combined with the excellent fuel consumption. Also by eliminating the plastic covers on both sides of the tank from the previous model, the tank has become slimmer and is now able to accommodate magnetically attachable tank bags. 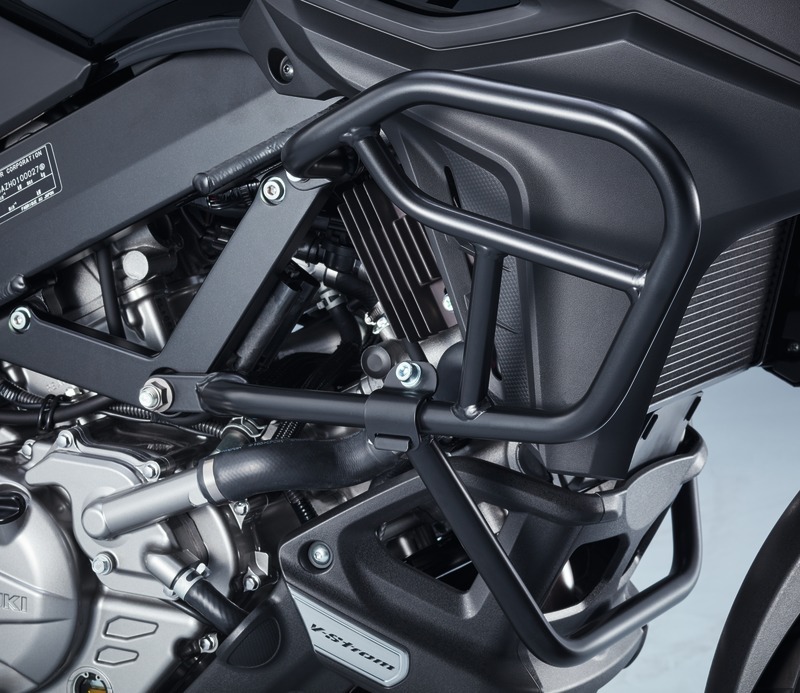 The frame covers which wore positioned directly underneath the seat on the previous model have been slimmed down as well, allowing the rider to reach straight down to the ground, resulting in better access to the ground and more confidence. 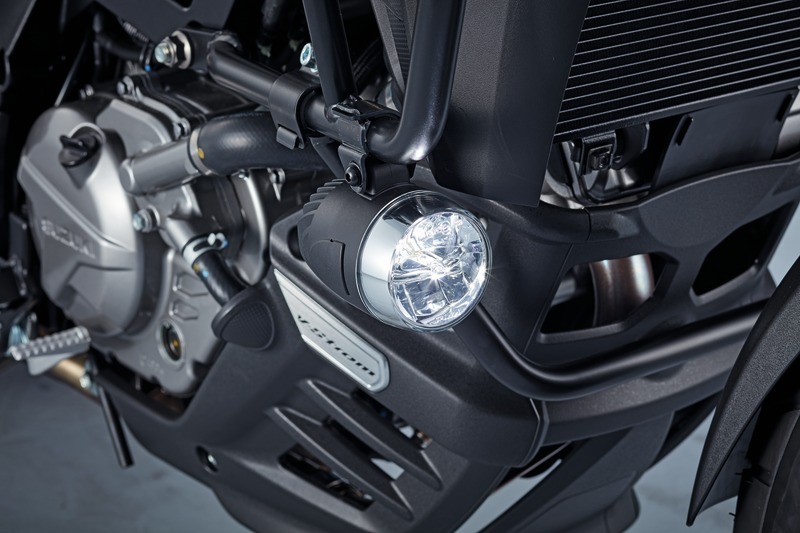 Contributing in giving the V-Strom 650 a totally new image is the head light and tail lamp, a common feature with the V-Strom 1000. The high and low beam of the light weight headlight is in a compact vertical configuration and realize brightness equivalent to the previous twin head lights, while when on high beam, both low and high bulbs illuminate providing a broader lit up area. The newly featured LED tail lamp, also in kin with its bigger brother, has a high visibility and contributes to weight savings. Ten spoked cast aluminum wheels are an eye-catching feature for the new V-Strom 650 ABS. 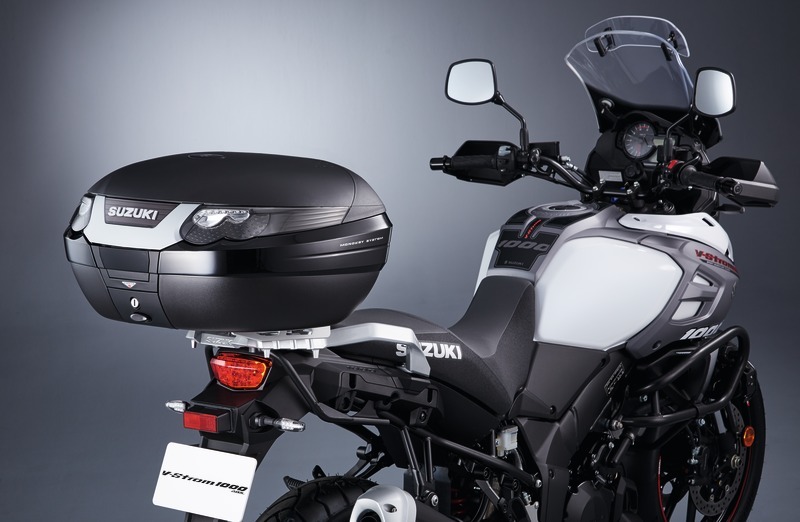 Not only do they give a sporty image in kin to its V-Strom 1000 ABS brother in the Suzuki Adventure model family, tracking back to the DR-BIG and DR-Z, but improves the road holding ability and reduces weight. The V-Strom 650XT ABS features tubeless tire applicable wire spoked wheels which absorb shock from the road better due to the flexible character of spokes, providing the rider with further comfort and exhilarated riding pleasure. The Champion Yellow colored model features unique gold-anodized rims in contrast to the black-anodized items on the other colors. 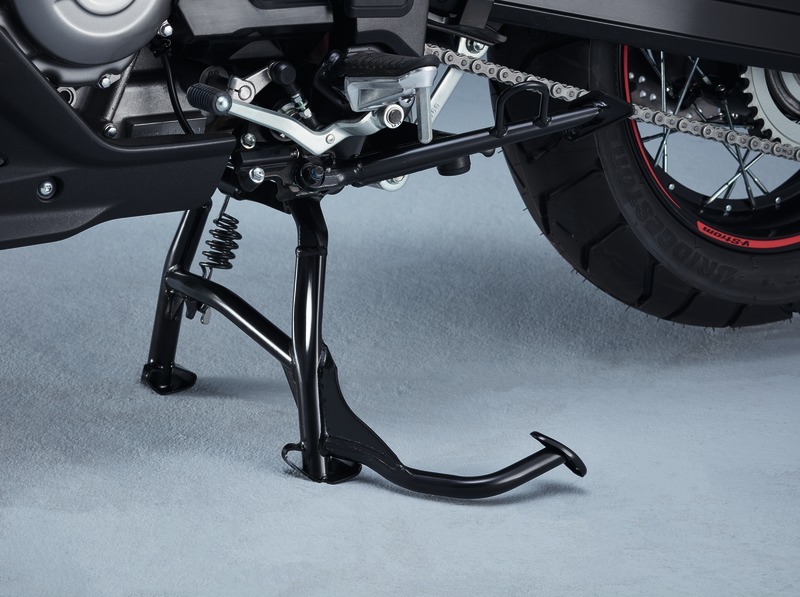 Wheel sizes are 19-inch on the front and 17-inch on the rear, realizing the perfect balance of stable and nimble handling, and newly installed tires are the stability and grip level heightened Bridgestone BATTLAX ADVENTURE A40, specially developed for the V-Strom 650. Most appreciative in the cold seasons of riding or in the rain, the grip heaters have undergone a model change. The new type has a thinner grip and is almost identical to the standard grips making it feel natural even when not using them. Also the switch is built in to the left hand grip making the device compact and easier to fit, while the hot wire inside the grip has been positioned all-round the grip rather than only half, providing a more effective heating efficiency. The rich accessory lineup include items such as touring screen, high/low seats, accessory bar, tank bag, chain guard, center stand, LED fog lamps, and LED turn signal lamps which comes in handy when loading the vehicle.